I examined how neighborhood improvement organizations can create a social environment which fosters sustained Latino political participation in Walla Walla, Washington. My main research question was: How have local organizations sought to increase Latino political mobilization in Walla Walla? The following two questions guided my project. First, what are the obstacles to Latino political participation? Second, how does involvement in local neighborhood communities overcome factors that have previously kept Latinos from voting? Methods: Previous studies have shown involvement in local organizations and social connections in the neighborhood to be an overwhelming predictor of political participation; my research was focused on discovering if this is also the case in Walla Walla. I chose to research two neighborhood organizations [Commitment to Community (C2C) and Washington Park Neighbors] and then compare them to the Latino American Forum in terms of increasing sustained participation. I formally interviewed 14 community members, many of whom were involved in one of my three organizations. I also conducted a survey through the Latino American Forum listserv. I further analyzed comments sent to the local newspaper, the Union-Bulletin, regarding its articles on Latinos, to assess the climate of racism that Latinos face. 1) Trust- Organizers develop trusting relationships with the individuals they are working with and this helps to overcome much of the distrust that many Latinos, feel towards the system, especially towards the police. 2) Empowerment- These organizations show Latinos that they can make a difference. 3) Common Group Identity- Neighborhoods that have a sense of shared problems and a shared fate can build a strong sense of community that encourages participation. 1) The city should offer incentives for neighborhoods to organize and fund C2C. 2) A community forum should be held to address issues of racism. 3) The County Auditor should create bilingual workshops on voting, targeting Latinos. 4) The Union-Bulletin should run another article series on Latinos, addressing racist responses to first series. 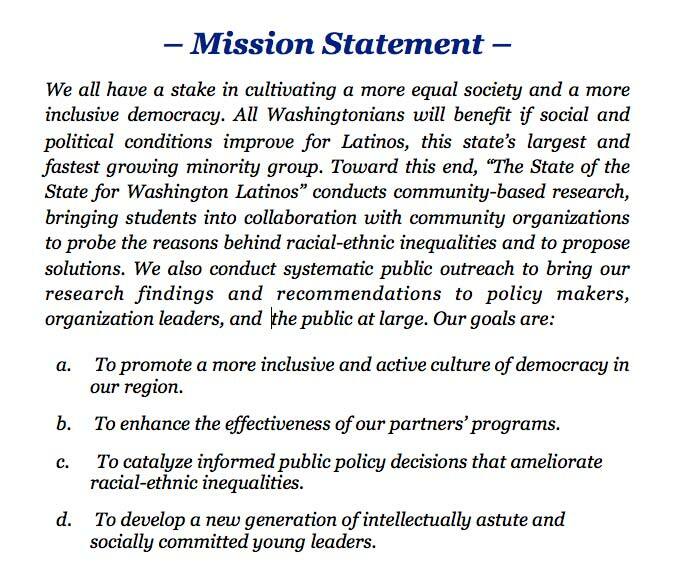 5) The Community Council should focus on race/culture in Walla Walla. 6) Further research should be done on a Latino Chamber of Commerce.